80 litre capacity removal/storage containers that can be stacked inside each other when empty or on top of each other when full. Hire charge allows for use with van hires up to three days; thereafter an additional charge of £1.50 per day inc vat. 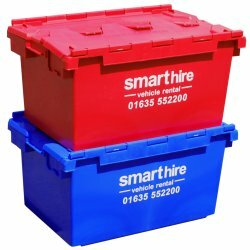 These can be hired in advance of and returned after your van hire to you allow to pack and unpack.